Washington, DC and Chicago, IL, February 14, 2017 – With refugees and other immigrants facing rapidly escalating challenges, the Appleseed Network today released a major new resource to help new and experienced attorneys navigate the complicated U.S. immigration court system and save immigrants from deportation, exile and persecution. The new Practice Guide, titled “Getting Off the Assembly Line: Overcoming Immigration Court Obstacles in Individual Cases,” is a product of the Immigration Justice Collaboration of Appleseed, a non-profit network of 17 Centers across the U.S. and Mexico, dedicated to advancing justice and opportunities that help low-income people and working families build better lives. A record half-million cases are waiting to be heard by U.S. immigration courts, which pose daunting obstacles: the near-absence of formal discovery, the challenges interpreting to and from foreign languages, and minimal out-of-court contact between attorneys, their clients and opposing counsel. “This Guide should help every attorney do a better job in immigration court — and encourage more attorneys to do pro bono representation in these courts,” said Steve Schulman, co-chair of Appleseed’s national board. “Better trained immigration attorneys will help insure that immigration courts are guided by due process and that they always follow the rule of law,” said Malcolm Rich, Executive Director of Chicago Appleseed. “For more than two decades, the Appleseed Network has helped refugees and other immigrants seek justice and opportunity in the United States and Mexico. In this critical moment of moral and legal challenge, Appleseed and many of its Centers around the country are redoubling our efforts to help vulnerable immigrants and refugees: through systemic reforms, pro bono representation, and efforts to help immigrants build better lives and make our nation stronger. The Guide is the next crucial step in that work,” added Bert Brandenburg, President of Appleseed. The law firm Akin Gump Strauss Hauer & Feld LLP provided pro bono assistance and counsel in the development of the new Practice Guide. This is the latest in a series of immigration-related research and publishing projects on which Akin Gump and Appleseed have collaborated. Previous reports have included A DREAM Deferred: From DACA to Citizenship (PDF) and Reimagining the Immigration Court Assembly Line. For more information and to download the report, please visit Appleseed’s website. 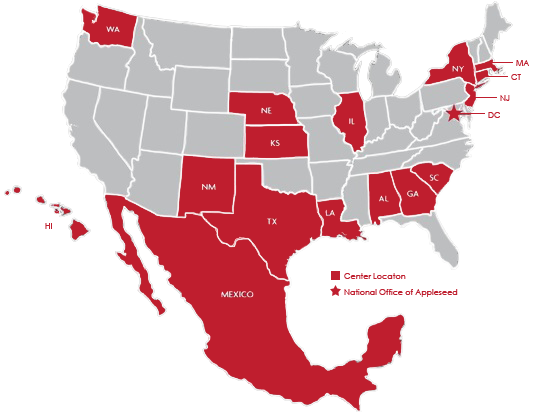 A nonprofit network of 17 public interest justice centers in the U.S. and Mexico, Appleseed is dedicated to building a society in which opportunities are genuine, access to justice is universal and equal, and government advances the public interest.